The Eagles announced new contracts for wideout Riley Cooper and center Jason Kelce on Thursday. A day after locking down left tackle Jason Peters to a large contract that will keep him with the Eagles for the rest of his career, Chip Kelly and Howie Roseman secured another pair of in-house players for the long haul. Philly announced Thursday deals for wideout Riley Cooper and center Jason Kelce. Cooper, who was reportedly close to a deal Wednesday, landed a five-year contract that is worth a reported $25 million according to Jeff McLane of the Philadelphia Inquirer. Here's a salary breakdown via ESPN's Andrew Brandt. 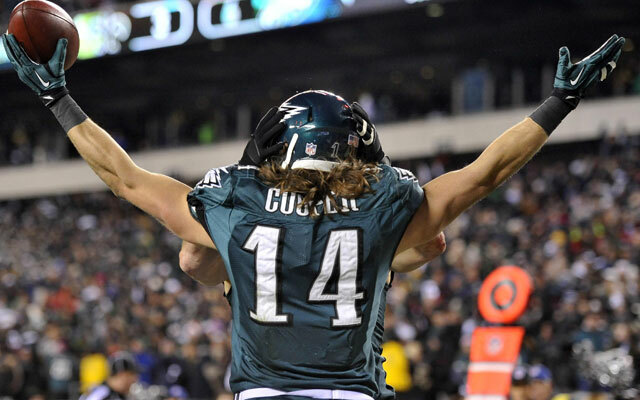 Riley Cooper to make $5M in 2014 - $4M bonus, $1M salary. Has $4M guaranteed 2015 salary and $1M of $4.5M 2016 salary guaranteed. That means this offseason is already better than last for the wideout, who made national headlines when he was caught using a racial slur on camera at a Kenny Chesney concert. Cooper rebounded both in the public eye and on the field, where he posted the best year of his career, catching 47 passes for 835 yards and eight touchdowns. “Riley is one of the toughest and hardest-working guys in our locker room. We talk a lot about how players have to make the most of their opportunities, and he did just that last year," Kelly said. "He used his size, strength and speed to make a lot of big plays for our team and I’m excited to watch him build upon his success." Cooper developed an instant rapport with Nick Foles, who took over at quarterback when Michael Vick suffered an injury and never looked back. "Riley’s a tough player who can not only go up and catch the football and make big plays, but who also takes a great amount of pride in his ability to block and be physical down the field," Roseman said. "He made the most of his opportunities last year and we all expect him to build upon that. Riley wants to be an Eagle and expressed that several times to us throughout this process. We were very excited to get this done before the start of free agency." Kelce's deal is a seven-year contract that will keep the 26-year-old center in Philly through his prime. The deal is worth $37.5 million total with $13 million in guaranteed money per Adam Caplan of ESPN. “Jason is the epitome of the type of player we want around here, both on and off the field," Kelly said. "He’s tough, extremely intelligent and is a leader by his actions and by his words. His athleticism is something that really sticks out when you watch him play. There aren’t many centers that can get down the field like he does." Drafted in the sixth round by the Eagles in 2011, Kelce blossomed last year in Kelly's system, starting 16 games for the second time in his three-year career and helping to pave the way for the top rushing defense in the NFL. He moved pretty seamlessly between two very different quarterbacks in Vick and Foles. “You just don’t see many interior linemen with the athleticism that Jason Kelce possesses," Roseman said. "It shows up on film many times where you just see him 10 or 15 yards down the field making blocks. His intelligence, work ethic and pride in his game are just off the charts. He’s the proverbial gym rat and is always at the NovaCare Complex working on his game. "This was the first off-season we had to re-sign Jason and we jumped all over the opportunity." Kelce is the first big extension to be done for a member of the 2011 NFL Draft class and now becomes a top-five paid center in the NFL.